Friday, January 8th, I headed downtown to enjoy an inspiring talk on the subject of Language at Creative Mornings. This event always ends with and introduction to next month's speaker, in this case playwright, theatre director and filmmaker Jordan Tannahill, who will present a talk on the theme of ethics for the February 5 edition of Creative Mornings. It was also shared that Tannahill would be in town as Curator-In-Residence for the PuSh International Performing Arts Festival running January 19th through February 7th, 2016. I was intrigued. 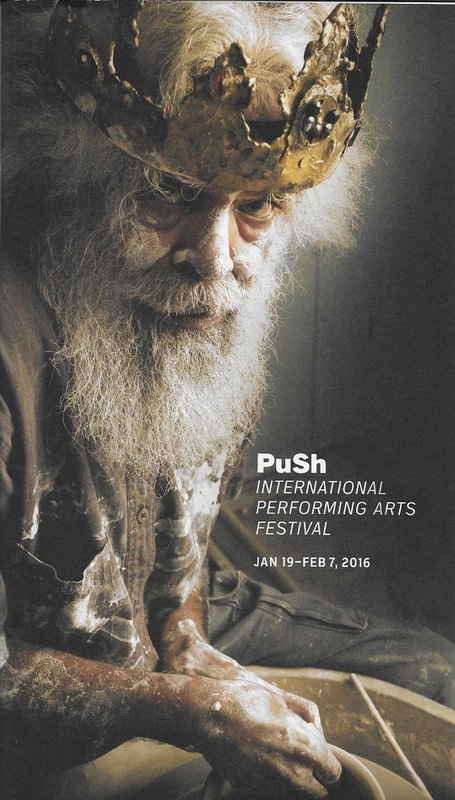 I have heard of the PuSh Festival, but so far have not attended. As I love innovation, especially in the arts, it's time to explore the performances offered and select a few that call to me. As I am also an interviewer by trade, I decided to pursue a behind-the-scenes interview with one of those involved in making all the magic happen - Associate Curator, Joyce Rosario. For those, like me, who are not familiar with PuSh, let's start with a bit about the festival itself. Held over a three-week period every January, the goal is to offer groundbreaking live performances, to "PuSh" boundaries and enrich audiences with adventurous, contemporary works. Here is an excerpt from the festival's website. of Canada’s best and an incubator of brilliant new work." Sounds interesting? Looking to be inspired? Well, it's all happening right here in Vancouver starting on the 19th. You can check out the full calendar listing of all performances by clicking HERE. When you find a show you want to attend, follow the links for tickets on the page for that performance. Got your tickets ordered? Well, now it's time to enjoy a brief Q and A with Joyce Rosario, Associate Curator of the PuSh International Performing Arts Festival, who will share the inside scoop on what to expect this season. Can you share a little bit about your career working in the field of performing arts. My career path makes sense now, looking back. Hindsight is 20/20, as they say! I’m 37 now, but going through most of my twenties, I was never really sure that I was on the right path. I studied theatre, worked in dance, I followed my curiosity, put myself in situations where I could learn through practice and then worked hard. I’m also lucky to have had some great mentors along the way. 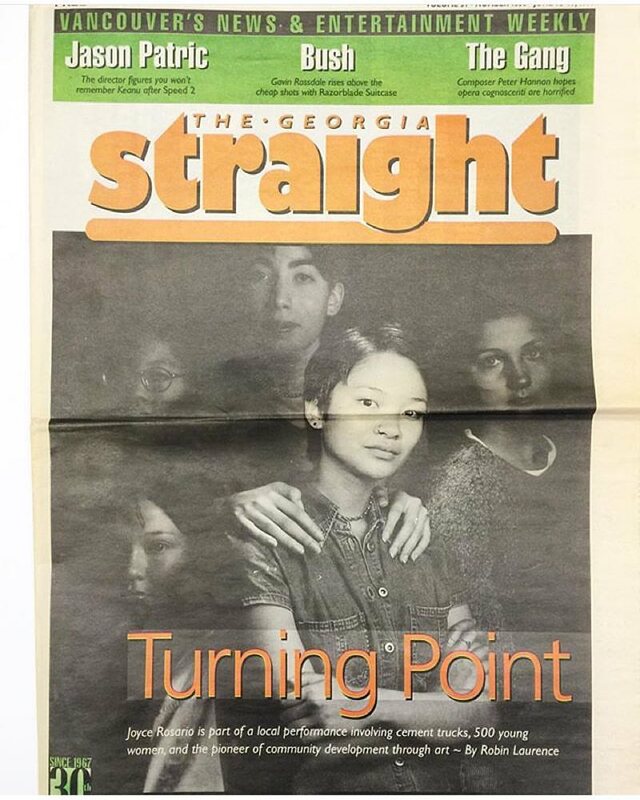 Last week, Marie Lopes from The Roundhouse was cleaning out her office and she sent me a hard copy of this Georgia Straight from 1997 (see below). 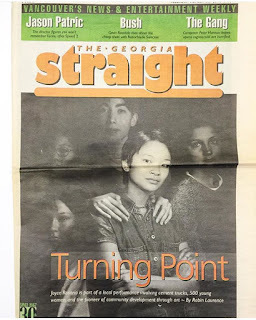 I was 19, going on 20, and was involved in a socially-engaged, participatory, performance art project that involved young women from all over the Lower Mainland. It was a 2-year project that culminated in us taking over a construction site. It was a formative experience, to say the least. How did you come to be a part of the PuSh Festival starting in May 2013 and what to you love best about your work here? The position of Associate Curator came up and Norman Armour, PuSh Festival’s Artistic and Executive Director, asked me to consider applying. I had a pretty great job at the time already, but I couldn’t say no – it’s a dream gig! What I love best is the group of colleagues I have the privilege to work with. They are superb human beings – talented, thoughtful, dedicated, with big hearts and open minds. It makes coming into the office every day a pleasure. 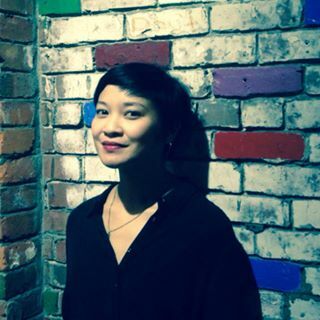 What does a the job Associate Curator entail during the time the festival is running? During the rest of the year as you prepare for the next season? When the festival is running, I’m super busy with hosting and attending events, everything from the PuSh Assembly to the many various performances. During the rest of the year, I travel to see work, watch videos and do tons of research and planning. We’re already working on the 2017 and 2018 Festivals. What is the biggest challenge in running performing arts festival in Vancouver? Competing with nature as well as disparity in funding. Compared to other similar events across the country, we punch above our weight. I love this description from the PuSh website - "...adventurous contemporary works in a spirit of innovation and dialogue." This type of performance may be a very new experience for first time attendees. Do you have any words of wisdom on what to expect or how to embrace these unique performances? Embrace the unknown. Come with an open mind. Bring a friend. Some shows might be challenging, and what is brilliant to you may not be for someone else. That’s an interesting conversation. What I love most about performance—whether it’s dance or theatre or music, or something that defies any of those categorizations—is its very liveness, it doesn’t exist without an audience. Art is always a very personal experience. Are there any shows this season that you in particular are looking forward to? As a curator, this is the question I’m asked most frequently. I’m looking forward to Inked and Murmur, Aakash Odedra is an exquisite mover. I can’t wait to be at Club PuSh at The Fox Cabaret, I love that we’re bringing contemporary performance to the nightclub scene. Jack Charles v. The Crown is going to be brilliant. Jack Charles is on the cover of our program guide, and the show is his story - what an incredible life he’s led and what a journey! Please share a favourite quote on the arts. Joyce Rosario has been working as the Associate Curator for the PuSh International Performing Arts Festival since May 2013 and has worked in the performing arts since 2003 as a manager, producer and programmer. She hails from East Van and is a graduate of UBC Theatre Production/Design Program.